The weight of the batteries creates a low center of gravity giving electric vehicles exceptional handling and cornering capability. The electric motor delivers instant torque (acceleration) at all speeds with no hesitations for shifting gears. They have only one gear! As soon as your foot touches the accelerator, it is uncanny to feel such power catapulting you forward, instantly and silently, without the roar of a gasoline engine. Buyers or lessees of new all-electric vehicles pay NO SALES TAX in Washington State if the purchase price is less than $35,000. Plug in hybrid electric vehicles that have internal combustion engines to provide range extension that have a battery only range of 30 miles or more also pay no Washington State sales tax if the purchase price is also less than $35,000. At 9.5% in Seattle, that could save you thousands of dollars. These sales tax exemptions were changed during the 2015 Washington Legislative session. The federal government will give you a credit on your income taxes of up to $7,500 for purchasing a new all-electric or plug-in electric vehicle. If you purchase a plug–in or all-electric vehicle with a 16 kwHr capacity or larger battery your credit will be $7,500. The federal government 30% tax credit to purchase and install electric vehicle charging equipment in your home expired in 2016. A good overview of all federal tax incentives for electric vehicles is available at the US Department of Energy. Driving 25 miles costs about $3.50 for a gallon of gasoline while it costs only about 35 cents for the equivalent amount of power from electricity. Much of the energy contained in gasoline is lost in combustion and heat whereas the efficiency of batteries and their electric drive means the fuel cost for electric vehicles is roughly one-tenth the cost of gasoline-powered cars. Electricity costs are regulated and predictable. Contrast that to gasoline, which has costs significantly more volatile and is becoming more scarce and more expensive to extract. 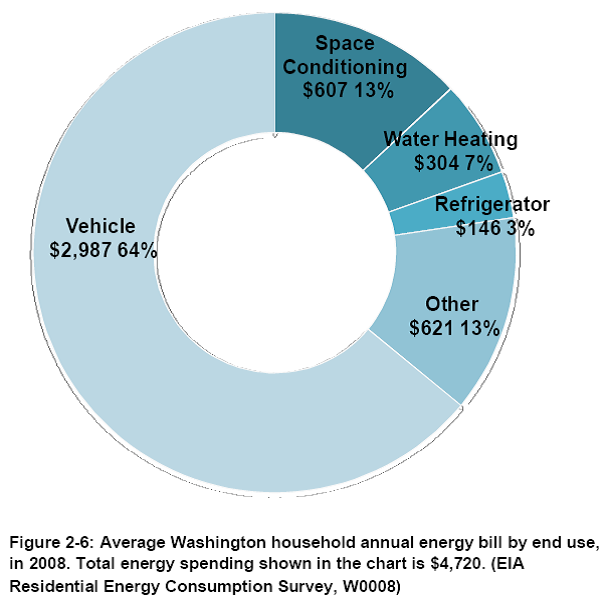 Washingtonians spend more than 64% of their annual energy bill on vehicle fuel. Wouldn’t you prefer stable fuel costs and less expensive fuel for your automobile? Electric vehicles have a simple powertrain with about 70% fewer moving parts than gasoline-powered vehicles. They don’t require oil, fuel or air filter changes. Electric vehicles do not require engine tune-ups. Electric vehicles do not use antifreeze. Electric vehicles do not use oil to lubricate their engine. Electric vehicles will never need a valve job, new fuel pump, injector cleaning or many of the other expensive maintenance requirements present in gasoline cars. Electric vehicles do not require the typical $300 service costs at 15,000, 30,000, 45,000, 60,000 miles. The only service that electric vehicles typically require is tire rotations every 7,000 miles and air conditioning coolant replacement at 100,000 miles. As an example, see the Nissan Leaf’s scheduled maintenance starting at page 7 of the Leafs’ Service and Maintenance Guide. Start every morning with a fully charged battery after charging your car while you sleep. It’s like having a gas station in your garage and filling your tank every day. Plugging a Nissan Leaf into a normal 110V outlet at 7pm and leaving for work the next day at 7am will provide about a 60% charge and a range of approximately 47.5 miles (13.2kwHr x 3.6 miles/kwHr where under typical driving conditions EV get between 3 to 4 miles/kwHr). Electric motors can last 1,000,000 miles. Batteries can last 8 or more years before needing replacement and are warranted for generally 8 years by most car manufacturers. Electricity is produced locally and electric vehicle infrastructure is installed locally, creating jobs and economic investment in Washington state. Electric vehicles provide greater flexibility to deal with shocks in the fuel-supply system because they have more diverse and distributed electricity generation sources (wind, utility solar, hydro, natural gas, rooftop solar). In January of 2011 in Washington State, 98.3% of all passenger cars and 90% of all personally used trucks can run only on gasoline (based on 2011 WA state department of licensing vehicle statistics). Light-duty vehicle electrification can be a potent catalyst for economic growth, contributing up to 100,000 additional jobs by 2030. On average, a dollar saved at the gas pump and spent on the other goods and services that households want creates 16 times more jobs. Unlike the fossil fuel supply chain, the majority of new demand financed by PEV fuel cost savings goes to in-state services, a source of diverse, bedrock jobs that are less likely to be outsourced. Individuals gain from economic growth associated with fuel cost savings due to vehicle electrification, whether they buy a new car or not. As a result of light-duty vehicle electrification, the average real wages and employment increase across the economy and incomes grow faster for low-income groups than for high-income groups. Much cleaner air (less smog) and much less CO2 and other pollutants emitted into the atmosphere. Cleaner local waterways (no oil, gas and antifreeze dripping onto roadways and washing into storm drains). Electricity in Washington is produced mostly by clean, renewable sources such as hydropower, wind and solar, which do not produce carbon emissions or smog or contribute to global warming. In Washington, the fossil fuel transportation industry produces more than 45 percent of the carbon emissions and water pollution. Electric vehicles contribute zero carbon emissions or pollution. Reduce cradle to grave CO2 by factor of 4 compared to current fossil fuel fuels. Research on neighborhood air pollution attributable to freeway traffic was conducted from an electric vehicle operated by the study team from UCLA, USC, and the California Air Resources Board. As long as the majority of freeway traffic consists of air polluting fossil fuel vehicles, this research offers suggestions about health risks measured within 1.5 mi of any freeway. Early morning hours are the worst. Ultrafine particles (UFD) were even detected upwind from traffic. According to Billy Frank, Jr, Chair of the NW Indian Fisheries Commission, electric vehicles help preserve habitat for endangered fish species. Helps keep the United States and other countries from polluting fresh water systems by reducing demand for oil and natural gas collected via fracking, coal and tar sands oil. Washington State spends $50,000,000 annually to clean up Puget Sound. Controlling the release of petroleum into Puget Sound storm water systems is one of four high-priority actions identified in the Control of Toxic Chemicals in Puget Sound study completed in 2011. The major sources of petroleum are diffuse, such as motor oil drips and leaks and minor gasoline spillage during vehicle fueling, and therefore offer ample opportunities for reduction efforts. Electric vehicles are the only option that gets greener as time goes on, as new sources of electrical generation come from non-polluting, renewable sources such as solar and wind power.